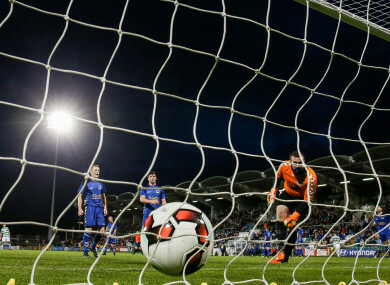 The game was put out of sight once the Leinster Senior League side were reduced to 10 men. Dave Hooper reports from the Tallaght Stadium. A BRANDON MIELE hat-trick sent Shamrock Rovers into the semi-final of the FAI Cup after a battling victory over Bluebell United. Miele gave Rovers the lead with an exquisite 25-yard strike on 21 minutes. With nothing on, Miele curled the ball over Andy McNulty into the net. The lead lasted less than two minutes when Bluebell’s Gary Seery beat Trevor Clarke to Dean Ebbe’s left wing cross and steer the ball home. Bluebell keeper McNulty was at his best keeping Dave McAllister’s 36th minute effort out, the shot – from the edge of the box shot – deflecting off Aaron Robinson. McNulty showed agility, leaping to push the dipping shot up over the bar. But he could do nothing four minutes later as Rovers regained their lead. Miele played a one-two with Ryan Connolly at the corner of the box before unleashing a pile-driver which left McNulty flat-footed for his second of the game. Connolly put clear water between the two sides six minutes after the restart finishing off a sweeping Rovers move following another one-two with Miele. Rovers appeared to be in control until Bluebell’s first proper attack of the second-half, which came with 19 minutes remaining. The Rovers defence at sixes and seven when the ball was switched. Substitute Richard O’Hanlon’s cross found James Stritch who slid in and steered the ball past Chencinski to breathe new life into the Leinster Senior League outfit. But Bluebell were dealt a huge blow just four minutes later when captain Anthony Griffiths was shown a second yellow card after a heavy tackle on Simon Madden. Miele put the game beyond the 10-men on 78 minutes. A brilliant run by Clarke was followed by him pulling the ball back to Miele to blast home his hat-trick. He becomes the third Rovers player to score a hat-trick in Tallaght Stadium as they progress to the semi-final. Email “Brandon Miele hits a hat-trick but Rovers are pushed hard by spirited Bluebell side ”. Feedback on “Brandon Miele hits a hat-trick but Rovers are pushed hard by spirited Bluebell side ”.